Cervical polyps with a common size less than 2 cm are a quite common pathology in the female adult population. They occur most frequently in multiparous women in the fifth decade of life. They can be responsible of vaginal bleeding and are exceptionally associated with a malignant pathology . Generally, the most common clinical presentation of a giant polyp is vaginal bleeding with malodorous discharge . They are often discovered incidentally and their size is less than 2 cm. Their removal is generally easily performed by a simple, ambulatory polypectomy under colposcopic vision . In contrast, giant cervical polyps with a size greater than 4 cm are rare and until now less than ten cases have been reported in the literature [4-14]. They occur in adult women extremely rare in adolescents and are frequently interpreted as malignant neoplasm at the time of the presentation [4,8,9,13]. In the current paper, we present the case of a cervical polyp of 12 cm in size occurring in a multiparous 48- year-old woman. The clinical and histological data of this rare entity has been reviewed according to the literature. A 48-year-old woman, grava 2 para 2, spontaneously presented to the gynecological consultation of the Nasu Red Cross Hospital of Tochigi for abnormal vaginal bleeding. She had no particular clinical history. She described an intermittent vaginal bleeding not related to the cycle and the vaginal bleeding occurred sometimes suddenly. Colposcopy was performed to observe a firm pink mass, not-well vascularized that originate from the posterior lip of the cervix. Magnetic resonance imaging (MRI) revealed a 12 cm × 7.5 cm × 6 cm　multiple intracavitary mass and smooth margins on high signal intensity on T2-weighted images (Figure 1). Radiological findings showed malignant tumor with polycystic lesion in uterine cervix such as uterine adenoma malignum. Whereas the colposcopic impression suggested a myoma of the posterior. Figure 1:MRI revealed a 12 cm ÃÂ 7.5 cm ÃÂ 6 multiple intracavitary mass and smooth margins on high signal intensity on T2-weighted images. During operation, the cervical canal was visualized and seemed to be at distance of the solid mass that arise from the posterior cervical lip (Figure 2). An ultrasonic polypectomy was performed with the Harmonic scalpel under general anaesthesia. The patient was under a postoperative follow-up was without any vaginal bleeding. The pathological diagnosis was a giant cervical polyp with a size of 12 cm and no sign of dysplasia and neoplasia (Figure 3). Figure 2:The tumor was arise from the posterior cervical lip. Figure 3:(a) Microscopically, it measured 12 cm and had a smooth surface and soft consistency. (b) Microscopically, the stroma was fibrous and focally infiltrated by a chronic inflammatory infiltrate. On surface, some squamous metaplasia involving glandular epithelium was observed. Cervical polyps are relatively common and have focal hyperplasia of the endocervical columnar epithelium. Cervical polyps are usually not symptomatic, but large polyps can present with increased vaginal discharge and intermittent bleeding. Cervical polyps are exceptionally associated with a malignant pathology. Recently, some authors analyzing the potential of malignant transformation recommended that not all, but only the symptomatic polyps or cases with abnormal cervical cytology be removed [15,16]. In the reported cases of giant cervical polyps, no malignancy has been described. However, the malignant potential of giant cervical polyps such as cervical cancer, cervical embryonal rhabdomyosarcoma, mullerian adenosarcoma, endocervical or endometrial adenosarcoma and cervical lymphoma may well remain elusive because of their rarity. We report the case of a giant cervical polyp in a multiparous adult patient. A literature search reveals no more than 13 cases of large cervical polyps reported in the last 20 years [4-14]. In all these reports, giant cervical polyp occurs in 10 cases in adult and in 3 cases in adolescence. 9 cases were nulliparous and 4 cases were multiparous with one of the two pregnant. 2 cases were after menopause and 10 cases had normal menstrual cycle (Table 1). The clinical symptoms reported are leucorrhoea, vaginal bleeding, malodorous discharge and a protruding mass. Pain is never reported as the main symptom. The clinical impression is reported in 6 cases and in five of them it is compatible with a cancer, and one of them compatible with an abortion. Five cases did not report the clinical impression. The size of these polyps varies between 5 cm and 17 cm. They can be intravaginal but sometimes they protrude outside the vaginal introitus spontaneously or after Valsalva manoeuvre. The treatment proposed was in 11 cases a polypectomy (one of these polypectomies was performed by laparotomy and hysterectomy). In two cases, a total hysterectomy was performed. One was abdominal procedure  and another was vaginal procedure because of the complicated with uterine prolapse . Interestingly, Sheth et al. reported that vaginal hysterectomy was performed in 28 premenopausal women with large myomatous polyps protruding from the cervix and they recommend that removal of myomatous polyps vaginally should be followed by a thorough assessment for deciding the route of hysterectomy because of sparing the women the trauma of an abdominal operation in women who need hysterectomy . Table 1: List of publications about giant cervical polyp. This review shows that the giant cervical polyp occurs more often in adult nulliparous women. Our patient was a multiparous adult woman and this is the fifth case described. Radiological exploration including ultrasound, scan or MRI may be useful in some cases to assess the extension of the basis of the polyp and to complete the clinical and colposcopical examination. Indeed, cervical polyp typically is showed a large multicystic mass filling the endocervical canal in sagittal T2-weighted MR image and hypointense fluid filling the cysts in sagittal T1-weighted MR image such like this case (Figure 1). The polyp has to be excised by electro surgery to determine the definitive histological diagnosis. At histologic analysis, the lesion was proved to represent cystically dilated endometrial glands and was diagnosed as a cystic polyp. Though all the giant cervical polyps reported are benign, their size, their clinical menacing appearance and their symptoms can mimic a neoplasm. A careful clinical and paraclinical examination must be done in order to avoid malignant pathology. The treatment is surgical and definitive diagnosis is given by histological features. Golan A, Ber A, Wolman I, David MP (1994) Cervical polyp: Evaluation of current treatment. Gynecol Obstet Invest 37:56-58. Terruhn V (1977) Polyps of the uterine cervix during the hormonal resting phase in childhood. GeburtshilfeFrauenheilkd 37:35-38. Abramovici H, Bornstein J, Pascal B (1984) Ambulatory removal of cervical polyps under colposcopy. Int J Gynaecol Obstet 22:47-50. Amesse LS, Taneja A, Broxson E, Pfaff-Amesse T (2002) Protruding giant cervical polyp in a young adolescent with a previous rhabdomyosarcoma. J Pediatr Adolesc Gynecol 15:271-277. Khalil AM, Azar GB, Kaspar HG, Abu-Musa AA, Chararah IR, et al. (1996) Giant cervical polyp. A case report. J Reprod Med 41:619-621. Saier FL, Hovadhanakul P, Ostapowicz F (1973) Giant cervical polyp. Obstet Gynecol41:94-96. Lippert LJ, Richart RM, Ferenczy A (1974) Giant benign endocervical polyp: Report of a case. Am J Obstet Gynecol 118:1140-1141. 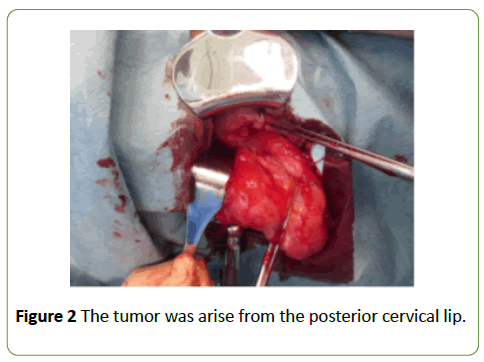 Soyer T, Demirdag G, Gucer S, Orhan D, Karnak I (2014) Giant cervical polyp with mesonephric duct remnants: Unusual cause of vaginal bleeding in an adolescent girl. Fetal Pediatr Pathol33:176-181. Aridogan N, Cetin MT, Kadayifci O, Atay Y, Bisak U (1988) Giant cervical polyp due to a foreign body in a 'virgin'. Aust N Z J Obstet Gynaecol 28:146-147. Duckman S, Suarez JR, Sese LQ (1988) Giant cervical polyp. Am J Obstet Gynecol159:852-854. Adinma JI (1989) Cervical polyp presenting as inevitable abortion. Trop Doct19:181. Branger C, Dreher E, Burkhardt A, Schmuckle U (1991) Giant polyp of the cervix. GeburtshilfeFrauenheilkd 151:148-149. Gogus S, Senocak ME, Arda IS, Buyukpamukcu N, Akcoren Z (1993)Multiocular endocervical polyp in a five-year-old girl. Pediatr Pathol 13:415-419. Bucella D, Frederic B, Noel JC (2008) Giant cervical polyp: A case report and review of a rare entity. Arch Gynecol Obstet 278:295-298. MacKenzie IZ, Naish C, Rees CM, Manek S (2009) Why remove all cervical polyps and examine them histologically? BJOG 116:1127-1129. Younis MT, Iram S, Anwar B, Ewies AA (2010) Women with asymptomatic cervical polyps may not need to see a gynaecologist or have them removed: An observational retrospective study of 1126 cases. Eur J Obstet Gynecol Reprod Biol 150:190-194. Massinde AN, Mpogoro F, Rumanyika RN, Magoma M (2012) Uterine prolapse complicated with a giant cervical polyp. J Low Genit Tract Dis 16:64-65. Sheth SS, Shinde L (1993) Vaginal hysterectomy for myomatous polyp. J Gynecol Surg9:101-103.